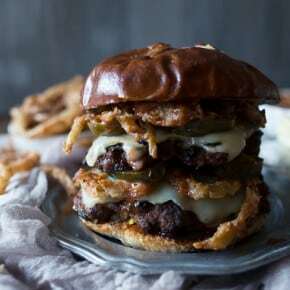 This chorizo beef burger with crispy onion straws is the perfect big mouth burger. Topped with bbq fry sauce, candied jalapeños and American cheese. Burgers are my jam. During the summer I make them all the time but I stick to the more typical grilled burger. You know the one – grilled with cheese and then topped with lettuce, onion and tomatoes. But it’s fall now and it’s time to bust out of that easy summer burger mode. Now it’s time to get crazy and give our burgers a little more zing. Lately I have been obsessed with chorizo (I’m really not kidding. OBSESSED!) so I wanted to make a burger that gave me the rich fattiness of beef but with the spicy flavor of chorizo. So that means I took them both and gave them a big ol’ mix. That’s right. This burger is 50% ground beef and 50% flavor packed chorizo. I may have also added in a little diced onion and shredded Land O Lakes Deli American because I’m a rebel like that. I could have stopped there but let’s not be silly. I decided to go all out and create a BBQ fry sauce, PLUS spicy crispy fried onion straws AND then I topped it all with sweet and spicy candied jalapeños. Seriously this burger is so packed full of flavor you will go crazy. If you’re a rational person you would simply take a bun, add a cheesy-topped burger patty and then add on the toppings. BUT we have already established this burger is not even close to rational so you should probably double that patty up and make this burger extreme. Also don’t get overwhelmed on what type of cheese to use. The choice is simple – Land O Lakes Deli American. This is the cheese of my childhood. My mom and I would go into the store together and rush to get to the deli counter to grab a number. Lines were always intense (especially on Sunday nights!) so it was important to get your number and be ready to yell your order when it was time. Since I was the lucky one in charge of helping my mom grocery shop I got to be the one to pick out the cheese for week. Of course I was a kid of great choice so I picked white American cheese not only is great on sandwiches it rocks on burgers and as a sneaky midnight cheesy snack. Looking for more burger recipes? Try my chicken souvlaki burger, smoked blue cheese patty melt or my open faced bbq chicken burger. Mix ground beef, chorizo, diced onion and shredded cheese and form 8 burger patties. Grill or fry until desired doneness and top each burger with 1 slice Deli American and let slightly melt. Spread bbq fry sauce on the top and bottom of your buns. 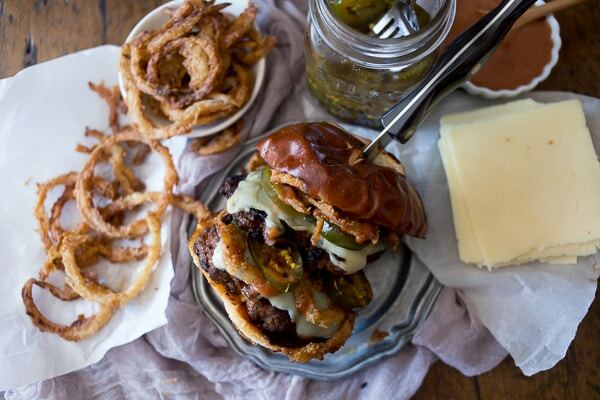 Assemble your burger in the following order: burger patty, onion straws, candied jalapenos, burger patty onions straws and candied jalapenos. Place thinly sliced onions in an 8x8 dish and top with buttermilk and hot sauce. Stir to combine and let sit for at least an hour. In another dish mix together flour, pepper, paprika and kosher salt, set aside. In a deep skillet or Dutch oven add oil and heat until 375 degrees. Keep any eye on the heat and try to keep it steady at 375. It’s ok if the heat drops a little right after you add the onions but it should bounce back. In several batches take a little of the onions out of the buttermilk and toss in the flour mixture to coat. Drop in the hot oil and fry until golden brown. Remove from the oil and place on a paper towel lined plate to drain any remaining grease. Continue until all the onions have been fried. Disclosure: This post was sponsored by Land O’Lakes but as always all opinions and thoughts are 100% my own. This burger is killing it! So many layers of yum! Seriously, how amazing are these?! My husband would be all over them! 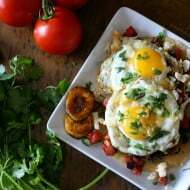 He is also a big chorizo lover and now that I see this recipe, I should make the special trip to the butcher to get some since that is our only location to buy this meat. 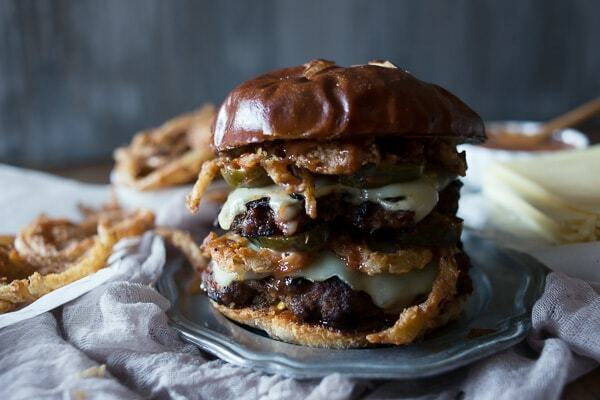 These burgers are seriously making my mouth water at 9am – haha! Love these! I didn’t have breakfast and thought Starbucks would cure my rumbling stomach. Nope. I NEED this burger. Seriously gorgeous photos, B! You had me at crispy onion straws. This burger…I would have absolutely no willpower around this thing. Gah!!!! I need to recreate this burger. Beef + chorizo?! LOVE!! I love everything about this burger, but especially those onions! And the chorizo. And the candied jalapeños. Yeah, basically everything – it looks amazing! GET. IN. MA. BELLY. Dang girlfriend that looks BOMB!!! I licked my monitor. The end. I don’t even eat beef and this picture makes me want to eat this immediately! sounds and looks like an amazing burger! I can’t even handle all of the deliciousness on this burger. It looks all kinds of amazing! Oh my, that burger looks so good! I love chorizo but have never made it in hamburger form. Looks amazing! Whoa, this is one flavorful, irresistible burger!!! I always was the one to grab the number 🙂 I wonder why deli counters don’t do that anymore?and I don’t know what is is about american cheese, it just brings me right back to childhood. You have taken your obsession to the max! 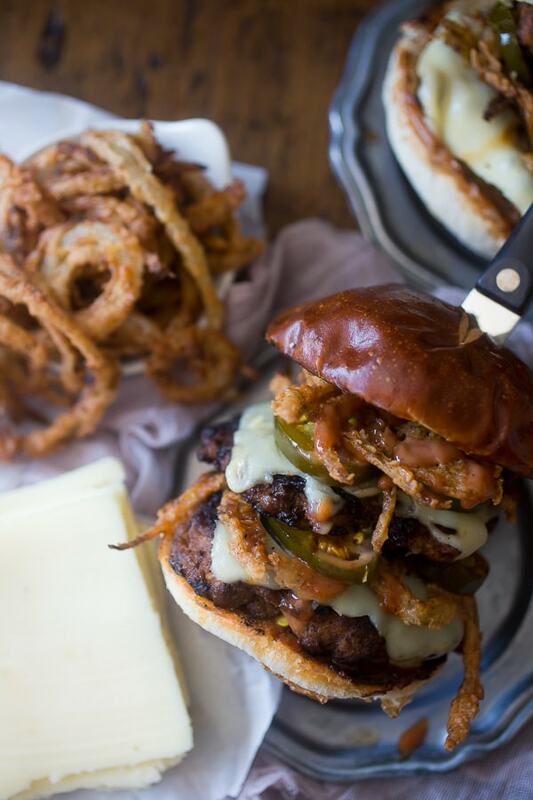 You have piled this original burger a mile high with the best of ingredients too! These are just too much! Oh my, I just love them and Im a bit chorizo obsessed too! I remember those days of grabbing a number at the deli. I wish they still did that! Chorizo is an awfully good call to make a burger as spectacular as this one. This looks seriously amazing! 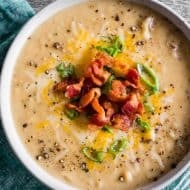 I love the addition of chorizo! These look and sound SO good! I love chorizo and it’s terrific that you’ve added it here, yummy! Wow these burgers would instantly be my husband’s favorite. This is exactly the kind of thing he orders every time we go out to eat. 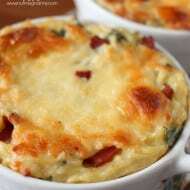 His birthday is next week and you’ve just given me recipe gold for his birthday dinner! Now THAT is a burger. I mean onion straws, chorizo, cheese….what more could you want in life? Any way to make this burger magically appear in front of me? You had me at the chorizo part but the onion straws are totally taking it over the top! How did you know that me and burgers were undercover lovers – because I want to take this burger out on a date and have my way with it. Well, if that didn’t sound creepy, I don’t know what does…. Seriously, are you for real with that? OMG, I wouldn’t know where to start, so I think launching face first is the best recourse. Beautiful photos too. 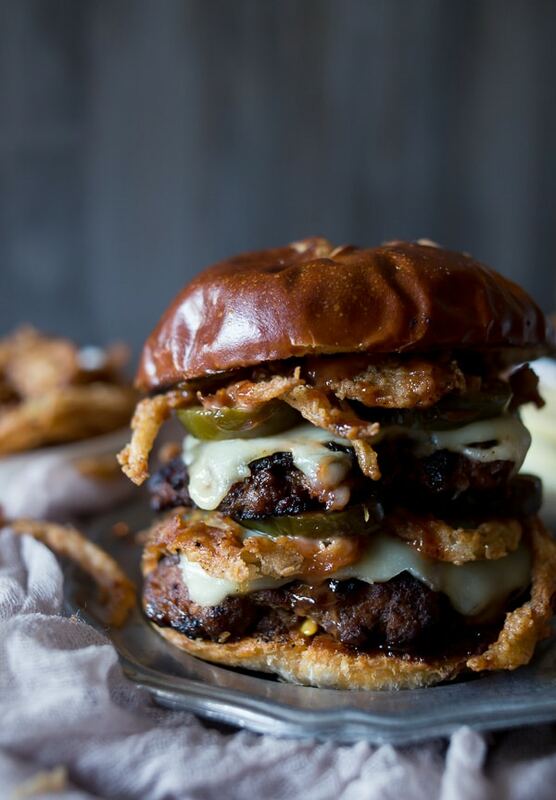 this was linked to a foodiecrush post featuring 25 epic burgers, yes very epic! I’m impressed by the scale of this but also with the chorizo addition to the ground beef, thank you for this!